The Art of Carlos Martyn Burgos - Stuff that happens between the ears, pours in through the eyes and claws at the heart. 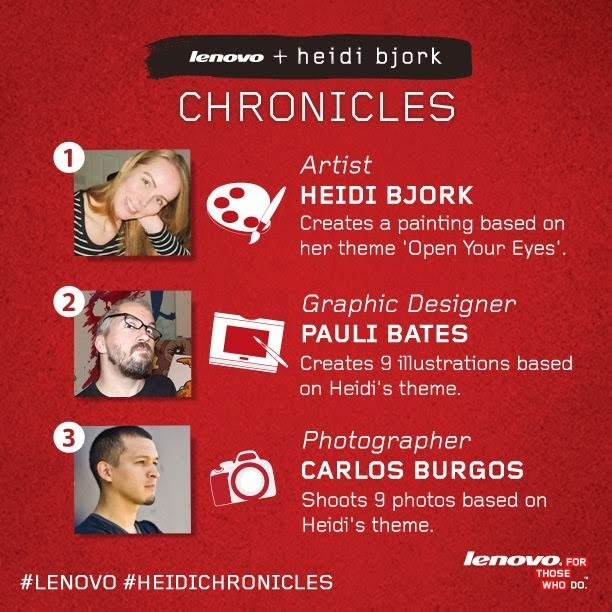 I can finally reveal a mini project I'm working on with computer manufacturer Lenovo and artists Heidi Bjork and Pauli Bates. A three week group project with the theme 'Open Your Eyes' which is now in its third and final week and now my turn to put my creative cap on, this time with a bit of photography. Week 3 – Carlos M Burgos will shoot 9 photos based on the theme. We would love for you to be part of this project also, helping with suggestions and interacting with us as we develop and share the final stage of this project courtesy of Lenovo. There's also a chance to win a Lenovo Touch Screen PC... so don't be shy, comment on our project for a chance to win. What's Time Got To Do With It? Copyright © 2010 ∞ C M Burgos. Simple theme. Powered by Blogger.